This study aims to look at the dynamics in the process of deteni handling (refugees and asylum seekers) to the protection of human rights in immigration detention. The case study is taken from Surabaya immigration detention (Rudenim). The researcher uses 7 (seven) indicators to notice the handling of the deteni seen from the aspect of human rights protection for deteni in Rudenim, namely the fulfillment of the right to life (for food), the fulfillment of the right to get clothing (clothes), fulfillment of the right to religious practice, fulfillment of the right to access health services, fulfillment of the right to education, the fulfillment of the right to the activity and recreation as well as the fulfillment of the right for deteni with special needs. Meanwhile, the researcher also looks at supporting and inhibiting factors from internal and external sides in the fulfillment of human rights in Rudenim. However, despite Rudenim Surabaya has some inhibiting factors in the fulfillment of human rights for deteni, Rudenim Surabaya can provide protection of human rights for deteni pretty well. APRIADI, Apriadi; YULIANTORO, Nur Rachmat. Perlindungan Hak Asasi Manusia Pengungsi Lintas Batas di Rumah Detensi Imigrasi (Rudenim) Indonesia (Studi kasus: Rudenim Surabaya). TRANSBORDERS: International Relations Journal, [S.l. ], v. 2, n. 1, p. 26-43, dec. 2018. ISSN 2598-9200. 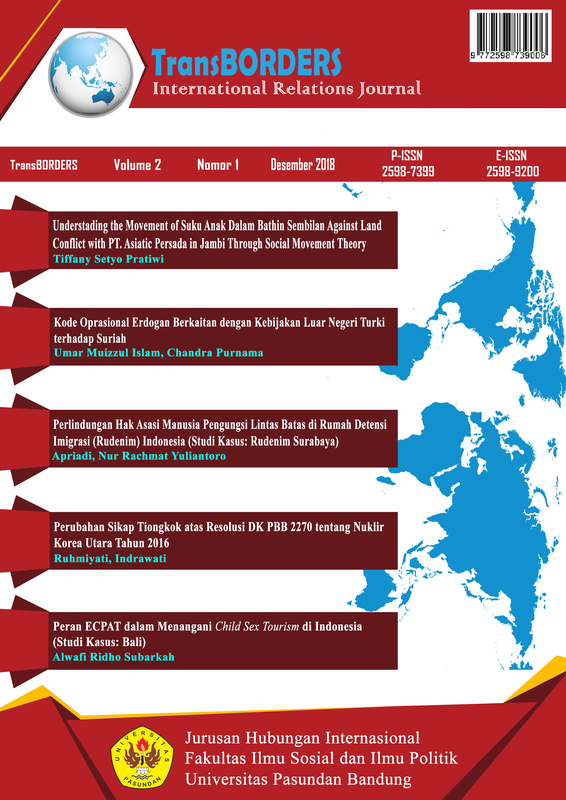 Available at: <http://journal.unpas.ac.id/index.php/transborders/article/view/1133>. Date accessed: 18 apr. 2019. doi: http://dx.doi.org/10.23969/transborders.v2i1.1133.